Butchering a hog was a November ritual on the Scheckel farm on Oak Grove Ridge outside Seneca in Crawford County in the 1940s and 1950s. All the crops were done, along with the haying, threshing, and most of the corn shredding. It was butchering time. All that spring and summer, and now deep into the cool autumn, there was one hog that did not get sent off to market at 200 pounds. There was one pig being groomed for first degree murder. The one selected for butchering. Butchering a hog was an all-day affair. Preparation started early in the morning. Water was heated in the big round black cast iron barrel that was earlier used for making their slop. What a remarkable twist of fate for the condemned hog! A little lye was added to the water. Dad said it aided in the task of getting rid of the hog hair. A block and tackle hung from a sturdy limb of the big oak tree. A single tree horse hitch was suspended under the block and tackle. The boiling cast iron barrel was positioned under the apparatus. Dad sharpened knives with an emery wheel powered by a foot treadle. A whet stone gave knives a final finish. A wash tub stood nearby to receive the guts from the hog. Dad allowed Phillip to be the executioner. 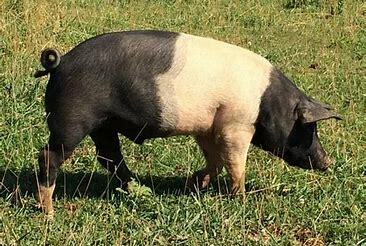 The pig was chased out into an open area in front of the Small Barn and enclosed with portable gates so his movement was restricted. We don’t know if Phillip closed his eyes, or flinched, or if the hog made a sudden jerk or movement of some sort, but… the gun went off, then the hog took off. That porker was wounded but not fatally. The chase was on. This could be a scene out of the Three Stooges, the short clips we saw prior to the main featured movie. Five or six kids were pursuing the stricken hog around the farm buildings, yelling and screaming. Oh, what great fun! Fun for us, but not the hog. He stopped long enough for Phillip to get in a second shot. This time, the hog flopped right over on its side. Dad came over and slit the hog’s throat. It was gruesome but fascinating. More on hog butchering next week.